Changpeng Zhao is the CEO of Binance. He is widely referred to simply as "CZ." 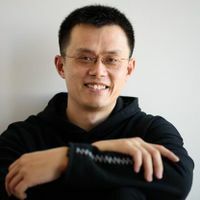 Photographed in a dark blue hooded sweatshirt, Zhao appeared on the the cover of the February 28, 2018, edition of Forbes, becoming the face of "Crypto's Secret Billionaire Club." After gaining experience in senior technical roles at Blockchain.info and OKCoin - OKEx's affiliate - Zhao created an exchange development company, BijieTech, which provided cloud-based trading technology to a number of Asian exchanges. When Zhao established Binance in July 2017, he left BijieTech and populated the senior ranks of Binance with senior developers and engineers from BijieTech. Before launching operations in July 2018, Binance announced an initial coin offering of its BNB coin, which would give users discounts for transactions on the exchange. The sale raised $15 million and the exchange started trading eleven days later. Emphasizing its transaction matching speed, reliability and security, Binance rapidly gained customers and became one of the top three most active cryptocurrency exchanges in the world, according to data aggregator CoinMarketCap. Huron Institute's October 2018 China Rich List estimated that Zhao has holdings worth approximately $2.2 billion. In December 2018, Changpeng Zhao was voted Coindesk's number one "Most Influential in Blockchain 2018." The list included ten other figures related to the crypto and blockchain space, including Elizabeth Stark, Nouriel Roubini, and Jed McCaleb. In March 2019, Bitwise released a report stating that 95 percent of spot bitcoin trading volume is fake. The report was based on order book data from 81 cryptocurrency exchanges reporting daily trade volume worth over $1 million. Zhao responded to the report by leaving a comment on Bitwise's post about it on Twitter. He said it was an "excellent report," but that "sadly, most investors who can't tell real vs fake volumes won't read such a detailed report." This sparked an intense argument over Twitter that included Larry Cernak and Frank Chaparro from The Block, a crypto-centric news site. Zhao was accused of having an ego "so tiny and fragile that constructive criticism, critical reporting, is viewed as 'attacking' and 'not being positive'" by Chaparro, who also told Zhao to "get a spine." Zhao was born in Jiangsu, China, to educators. His family emigrated to Vancouver, Canada when he was young, and he went to high school and college in Canada. From 2001 to 2005 Zhao was head of Tradebook futures development at Bloomberg. Moving to Shanghai in late 2005, China, Zhao was an early partner at Fusion Systems Group, an IT and software development consultancy which specializes in trading and banking applications. At Fusion Systems Zhao closed deals for trading systems for Credit Suisse, Goldman Sachs and Deutsche Bank, among others. He stayed at Fusion Systems for eight years. In December 2013 Zhao took his first job in crytpocurrencies when he became head of development at the cryptocurrency wallet company Blockchain.info, now known as Blockchain.com. He worked there only until May 2014, when he joined OKCoin as CTO. At OKCoin Zhao led the launch of their "futures" trading. His stay there was also relatively brief. Zhao left OKCoin abruptly in February 2015. Details of his departure emerged when venture investor Roger Ver later sued OKCoin. In statements about his time at OKCoin, Zhao alleged that OKCoin operated self-dealing trading bots which inflated reported trading volumes on the exchange as well as hinted at financial improprieties. Later that month, Shapeshift and Kraken announced that they would be doing the same. Zhao studied computer science at McGill University in Montreal, Canada. ↑ Heads of Bitmain, Binance and Other Crypto-Related Businessmen Among China’s Richest. Cointelegraph. ↑ CoinDesk's Most Influential 2018. CCN. ↑ Blockchain Exec Joins Largest Chinese Exchange OKCoin. Coindesk. ↑ Changpeng Zhao (CZ) CTO of OkCoin Resigns. Cointelegraph. ↑ Former Exec Hits Back at OKCoin Amid Contract Dispute. Coindesk.